Read news and information about the Calgary brewing industry, its practices, and key events, from a Prairie Dog perspective. We at Prairie Dog are incredibly passionate about Alberta beer and consider ourselves fortunate to reside in the province that grows the world’s best barley and wheat, which it supplies to some of the biggest names in craft beer. In the current atmosphere of incredible craft beer growth, it can sometimes feel like we are perfect. Our beers are great, the people we meet are so positive and awesome, and the industry is a joy to be a part of. However, we worry that this era of bliss can lead to complacency and a false sense of security among brewers and brewery owners. This article is the first in a series devoted to Quality Management, our first defense against complacency and an often-overlooked topic at fledgling breweries, who often struggle just to keep up with demand. Only five years ago the Alberta craft beer market was sparse, with maybe ten or fifteen breweries dispersed throughout the entire province. Today we are at closer to forty, and that sounds like a lot, but it really isn’t anywhere near the density found in places like Colorado or Oregon, which each have hundreds of breweries (see this map of Denver). There is a lot to be said for (friendly) competition — it tends to drive up quality and consistency over time. Mature, competitive markets produce some of the most highly-rated, innovative craft beer today, and the reason for that is probably that the brewers there have to work hard to stay relevant in their crowded markets, producing consistent, defect-free beer. Quality Management could mean the difference between long-term success and failure of these breweries. We already have several great Alberta breweries that can compete against those breweries on quality, like Troubled Monk, who won silver at the 2016 World Beer Cup in Philadelphia for their brown ale against 80 other breweries worldwide. Products like this will help push the entire Alberta beer industry forward and elevate the expectations of consumers. However, if we really want Alberta to become known as a world craft beer destination, we all need to do our part by working with each other and putting our egos aside, comparing our beers, seeking out people who have well-developed palettes for constructive criticism, and continually striving to improve quality, even when it already looks excellent. Quality Priority Pyramid from the Brewers Association. 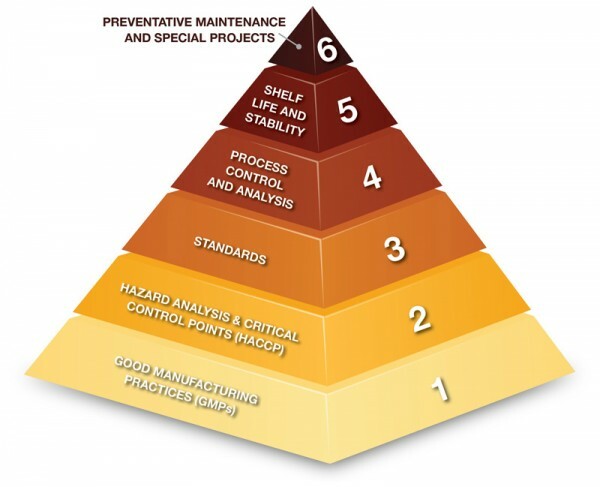 Before a brewery works on things like improving shelf life, it must first focus on good manufacturing practices (GMPs), hazard analysis and critical control points (HACCP), developing standards, etc. Each step in the pyramid relies on the one underneath. To this end, we brewers need to implement and stand by Quality Management standards and procedures based on industry best practices. The Brewers Association has great information and books about how to do this for breweries of various sizes. Quality Management programs cover everything from what ingredients are purchased to how a beer is brewed, fermented, stored, and served. Quality Management is something that no brewery does perfectly and should be continually improved over time. Even though we are far from opening our doors, our Director of Quality and member of the American Society of Brewing Chemists, Sarah Goertzen, is already hard at work studying industry best practices and building a set of procedures and standards for Prairie Dog. Part of this process is learning how other breweries approach QM and evaluating our processes against those of existing breweries that we admire. As a big part of Quality Management, we need to invest in qualitative analysis for our beers. This doesn’t need to be a costly affair, but it does require some effort. Here at Prairie Dog, we are working to build a tasting panel consisting of friends, family, Cicerones, BJCP judges, and future staff, all of whom have been exposed to a lot of varieties of beer and participate in off-flavour tastings to learn to identify faults like DMS, diacetyl, acetaldehyde, infection, and staling/oxidation in beer. In the future, our tasting panel members will be invited to try new beers before we make them public, providing their impressions of any off-flavours that are noticed. We will conduct triangle tests with our panel on different batches of the same beer to measure and ensure consistency between brews. Most breweries are already giving away a lot of beer to friends and family in some way, so why not make them feel empowered by educating them and involving them in determining the direction of our beer? Everyone has blind spots in their palette and should assume that they can’t taste some of the things in their beer that others can, especially us brewers, who may be blinded by love for our craft. For quantitative analysis, several laboratories will test beer for various off-flavours that result from process issues or infection, for a nominal fee. It may be costly to lab-test beer on a frequent basis, but it is definitely a good idea to do it periodically to ensure that changes in equipment, ingredients or procedures haven’t negatively impacted the finished product in a way that was missed by the brewers or tasting panels. Some of the lab instruments required for QM are not expensive, like microscopes, plates, dyes, balloons and test tubes, and the American Society of Brewing Chemists has come up with novel ways of testing various characteristics without the use of costly instruments. Finally, we can never consider a recipe “finished”. Our recipes have to evolve over time with access to ingredients, and our brewing processes will evolve to maintain pace with industry learnings and best practices. As brewers, we need to stay in touch with the rest of the industry about what is going on, first by working with others locally, then by leaving our bubble and attending conferences like the Great Canadian Beer Festival, Craft Brewers Conference or Great American Beer Festival (GABF), where industry leaders give talks and share information, and beer from a variety of areas is available to taste and compare with our own. GABF is this week, October 6-8, in Denver, Colorado. All of the founders of Prairie Dog Brewing will be attending the conference and touring breweries like New Belgium, Avery and Funkwerks, helping us maintain our connection to the craft beer movement as a whole. Mature and well established craft beer markets play host to craft breweries that have stood the test of time and risen to a level of quality production that we wish to emulate. A lack of Quality Management at any local craft brewery can leave a bad taste in customers’ mouths and hurts the reputation of our industry. We all have a responsibility to ourselves, our customers and our peers to ensure that Alberta beer quality is just as high as you would find in Denver, Portland, Vancouver or Vermont. We are interested in knowing what you think of Quality Management in Alberta breweries. Is there something we missed? Have a question or a comment about this article? Comment below or follow us on Twitter, Facebook or Instagram and let us know what you think.